In part two of my Five Tips For Perfect Twister Side Control we are going to look at some more ways that you can create a killer Twister Side Control. if anyone has had a chance to try the first two tips and has some feedback please leave a comment below. If you didn’t get a chance to check out Part 1 of this series please click here. Now let’s move on to three more ways you can create an awesome Twister Side Control! When playing Twister Side Control it is important to distribute your weight so that you contain and pin your opponent to the mat. To do this you need to make sure that you sit on your partner’s shoulder. One of the biggest mistakes I see Jiu Jitsu players making when they play Twister Side Control is that they sit on the mat. Sitting on the mat will not pin and contain your partner. One way that you can test if you have perfect Twister Side Control is to pick your elbow and legs off the mat. If you have a perfect Twister Side Control you should be able to “surf” on your partner. To prevent your partner from moving you around while you are in Twister Side Control you need to keep a wide base. Keeping a wide base will also help when your opponent starts to buck all around. The concept here is very similar to what you would do when you have a mount. You want to make sure that no matter which way you move on top, you have a something that can post out and help you regain your positioning. I can’t begin to stress this tip enough. Checking the knee in Twister Side Control is important for two reason. 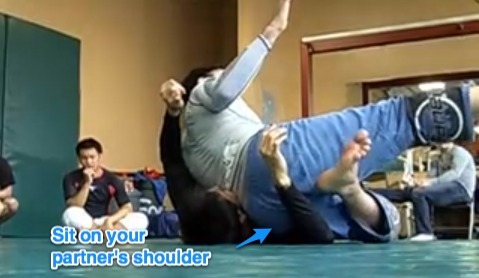 By checking the knee I am creating a post that helps me push my back and ribs into my partner’s face. If my partner is able to get his hands onto my back and push my down towards his feet, then I can use this post to help me push back up into my position. Checking the knee is also important for those of us who don’t want to go home with black eyes. By checking this knee you are preventing your partner from throwing his leg up and “accidentally” kneeing you in the face. So there you have it! Five tips for perfect Twister Side Control. If you need any help learning more about how to use Twister Side Control for No Gi Jiu Jitsu or MMA, stop by 10th Planet Van Nuys and we can help turn your game around right away! I needa try this out tonight!! Thanks Ryan! !